To edit a role, go to ‘User Management’ section on the side menu and then click on the ‘Roles’ tab. 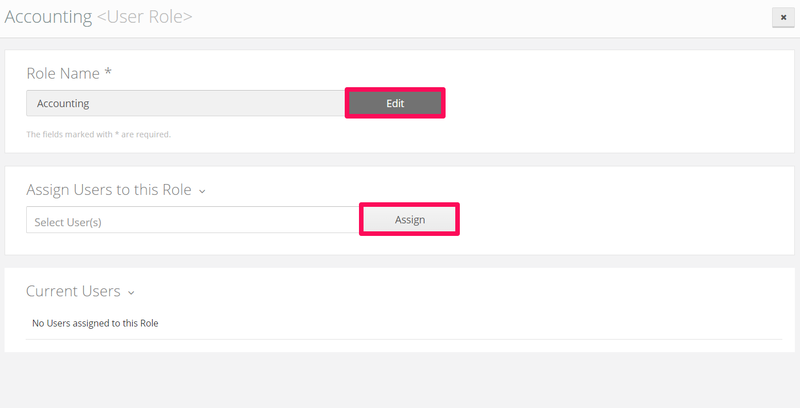 A list with all existing roles in your organization will be displayed. Next, move the pointer over the role you want to edit and click on the pencil icon at the right of the role. 1. Edit the role name. 2. Assign users to that role. The advantage of assigning several users to the same role is that then if you assign a task to that role (and not to individual users), the task will appear in the Inbox of all the users assigned to that role. After having edited the name and/or number of users assigned to a particular role, click on ‘Save’ and you will have finished editing the role. What happens if I change the name of a role? At a first glance, changing the name of a role won’t impact the normal function of the workflow. For example, if a role was assigned to a task and, after that, its name was changed, the role will continue being assigned to the same task under a new name. If you want more information about a potential problem that may arise from changing the role name, visit the post Combo Boxes With Roles as Data Source.